Our range of loaves is growing and now incorporates a wide array of breads taking inspiration from across the globe. Our focaccia sheets are available in a range of flavours and are always popular due to their incredible versatility. A generous and flavoursome stick of fragrant French bread ready for you to bake to perfection, filling your establishment with the irresistible aroma of freshly baked bread. Triple proved for depth and richness of flavour. Made for sharing, great for dipping in oil and vinegar. The centrepiece of a platter and excellent with all Mediterranean cuisines. Delizioso. Made with love from strong flour, yeast, salt, water and extra virgin rapeseed oil to create a 100% British bread with a passionate Italian heart. Equally good for split Mediterranean toasts and deli sandwiches. A delicious mixed grain bloomer made with rye, wholemeal & white flours, perfect for designer sandwiches & toast. These traditional dimpled Italian focaccia sheets are made with rich sourdoughs and extra virgin rapeseed oil. Available as rosemary or tomato & basil, this focaccia bread is perfect for real Italian panini. We dip the focaccia dough in extra virgin rapeseed oil and then bake it. This gives a wonderful coating that is full of flavour. Warm gently to encourage that delicious, rosemary flavour. Can be broken into four equal portions to be served with soups and meals. Soft, flavour-rich sun dried tomatoes give this very special ciabatta extra impact. Ideal with soups, casseroles and salads, it’s also gorgeous simply dipped in olive oil. Our olive ciabatta is light and fluffy with an open texture and a fragrance that’s almost impossible to resist, generously embellished with organic olives. This popular bread has a multitude of culinary purposes, whether it’s simply buttered, toasted for panini, used for sandwiches or the base of a perfect bruschetta. A rustic Italian country bread from the Puglia region. Made with extra virgin rapeseed oil and a long slow double fermentation for a truly heavenly taste. A double fermented bread made with a wheat sourdough and stuffed with juicy black olives. Shaped by hand with care for a truly rustic finish. Full of the flavour of the Mediterranean, this bread is bursting with the sunshine of the region. Close your eyes and you’re there! This lovely loaf is made with a multigrain flour, and then extra seeds are added to make it even more tasty and nutritious. This large crown shaped French country bread makes a superb centre piece and tastes great too. 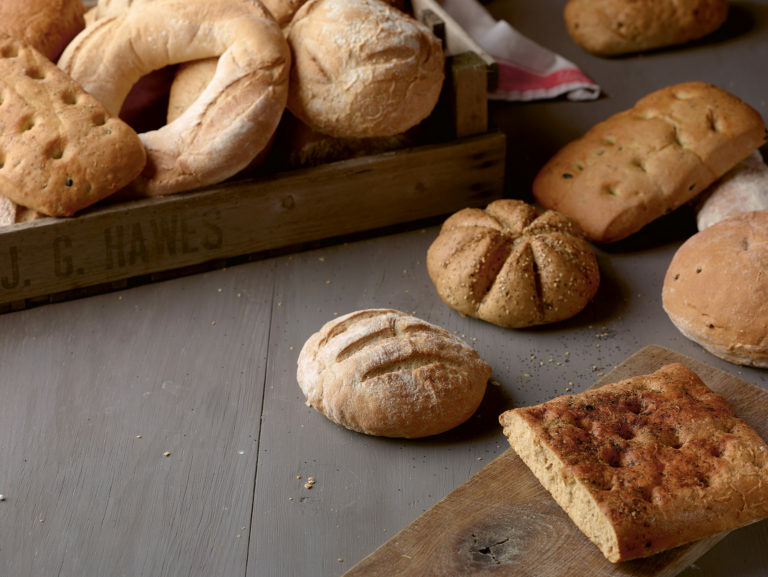 All our loaves can be given a fantastic crust and an even fresher “freshly baked” flavour and aroma. Just pop the thawed product into a pre-heated oven at 170–200ºC for 4–5 minutes for a fresh and crusty loaf. A wonderful rustic sourdough loaf, great for sandwiches and bruschetta. Floury topped, rustic rye loaf. Delicious for sandwiches or toasted.